Linköpings fäktklubb is based at T1, close to the city centre of Linköping between the university (Campus Valla) and the university hospital. The club offers training in epee at all levels from beginners to elite performance. In our fencing hall we offer five electric pistes, changing rooms, a sauna and a workshop. 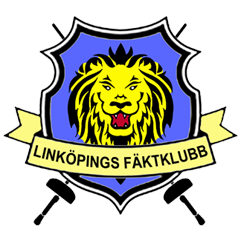 Linköping fäktklubb was founded in 1970 and has been the home of many competent fencers ever since. Our professional and highly qualified Romanian fencing master Calin Harbu ensures that the beginner’s courses as well as our open training sessions will help you develop your skills constantly. Have you been fencing before? In that case, please come by the hall some evening to say hello or contact us at borjafakta@linkopingsfaktklubb.se. Our trainings take place Monday-Friday. If you are a beginner, we want you to participate in our beginner’s course called the fencing school (see below) before you can join the open trainings. If you are an experienced fencer, the fee for one semester is SEK 2200 (with an additional SEK 300 to be paid if you need to borrow equipment from us). For full time students the discounted fee is SEK 1500. 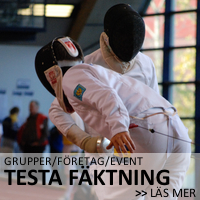 If you only do the Free Fencing on Wednesdays, then the fee is SEK 1200. 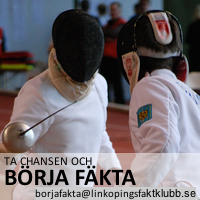 Linköpings fäktklubb offers fencing courses for beginners. The fencing school consists of a course of six lessons were the basics of the sport are taught so that you afterwards can participate in our training sessions. You find dates and times at the first page. The equipment needed is sweatpants or tights, gym shoes for indoor use, a watter bottle and a towel (should you want to take a shower). The club provides you with the rest of the equipment. The fee is SEK 800. To sign up, please contact us via email to borjafakta@linkopingsfaktklubb.se stating your name, address, e-mail and phone number as well as your Swedish id-number (personnummer) if you have one. If you understand Swedish, you can also use the sign-up form here. Please note that the fee is to be payed by “bankgiro” (on BG number 5030-3361) or Swish (our number is 123 561 0191). Please observe that you must pay within 7 days of the email confirmation of your participation. If you do not pay within 7 days, your participation will be cancelled. We do not refund the fee unless you can show a doctor’s certification of your illness. After you have completed the basic fencing course you may continue to fence with our regular training groups. The fee for the rest of the semester is SEK 500. Equipment is included for the fencing school and the continuation of the first semester. The fee for the second semester is discounted to SEK 1450 (full time students SEK 1000) and equipment rental is SEK 300.